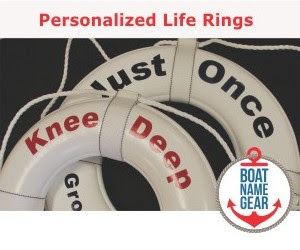 Despite the cold weather throughout much of the US (we got our first snowfall here in CT this a.m.), there were still enough boating incidents over the weekend to share some valuable boat safety lessons. Stories of boat fires and small boat capsizes popped up in Oregon, New Jersey, Ohio, and Florida. Luckily, there were few injuries reported due to heroic efforts by local police, fire and Coast Guard personnel, and in some cases, a lot of luck. In Portland, Oregon, a boat fire that started with a propane leak on one boat, eventually spread to five boats, and set off a power outage across the neighborhood of the marina where the boats were docked. The burned boats included some liveaboards, and a couple of the boats were cut loose and set drifting (and flaming) towards a nearby yacht club, so it is very lucky there were no injuries. 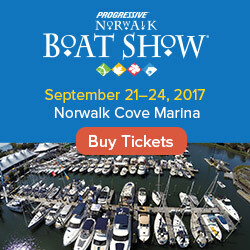 (Full story) Avoid this by checking FirstBoat’s boat fire safety resources. Part 2. 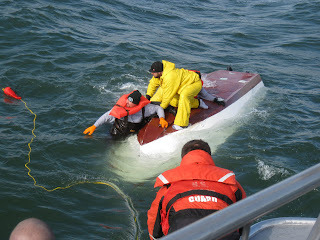 Four men also had to be rescued after their 21 foot boat capsized in 4 to 8 foot swells on Lake Erie on Friday. Unlike the four men rescued in New Jersey, these guys used a cell phone and called 911, which should not be your first choice when you get into trouble on the water. Luckily, these guys were close enough to the Cedar Point breakwall to avoid going down with their boat. Full Story. Down under, it was small speedboat vs. big ferry on Sydney's Parramatta River injuring six people – all passengers of the speedboat. Witnesses and those commenting on the story seem to be jumping to the conclusion that the smaller boat was speeding and should have gotten out of the way of the larger, slower ferry.